6197. Pierre Cyril MCMULLEN 1 (Laura Minerva KEINARD , Margaret Elizabeth KENNEDY , Hannah BITLER , Jacob , Daniel , Johannes ) was born on 7 Feb 1915 in PA. He died in Apr 1987. Pierre resided in 1920 in Union Twp, Berks Co, PA. He was issued a social security number before 1951 in PA. He resided in Apr 1987 in Birdsboro, Berks Co, PA 19508. Pierre married Lillian M PELLICOTTI about Oct 1932 in Berks Co, PA.
Pierre also married Bessie Irene EVANS [scrapbook] 1, daughter of Heber EVANS and Emma GEIGER, about 23 Oct 1939 in Berks Co, PA. Bessie was born on 9 Feb 1917 in Geigertown, Berks Co, PA. She died on 23 Jun 1986 in Reading Hospital, West Reading, Berks Co, PA. She was buried on 27 Jun 1986 in St. Paul's United Methodist Church Cemetery, Geigertown, Union Twp, Berks Co, PA.
Bessie was issued a social security number before 1951 in PA. She resided in Jun 1986 in Birdsboro, Berks Co, PA 19508. 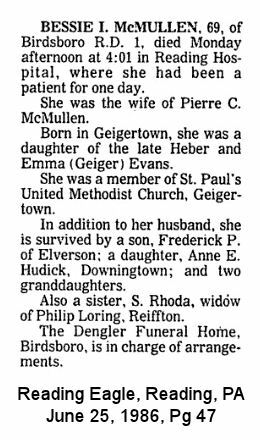 She was a member of St. Paul's United Methodist Church in Geigertown, Berks Co, PA.
+ 11335 M i Frederick Pierre MCMULLEN. + 11336 F ii Anne E MCMULLEN. 6198. Edythe Lucia "Edith" MCMULLEN (Laura Minerva KEINARD , Margaret Elizabeth KENNEDY , Hannah BITLER , Jacob , Daniel , Johannes ). Edith married Cyril Vincent LEDDY. Cyril was born on 17 May 1911. He died on 12 Aug 2008 in Reading, Berks Co, PA.
Cyril resides in 121 Lucinda Ln, Wyomissing, Berks Co, PA 19610. He resides in 13209 Sherburne Cir, Bonita Springs, Lee Co, FL 34135. He was issued a social security number in 1956/1957 in PA. He worked as Dentist. + 11337 F i Anne LEDDY. + 11338 F ii Cheryl LEDDY. + 11339 M iii Cyril Vincent LEDDY Jr.
+ 11340 M iv Michael Patrick LEDDY. 6199. Loretta Keinard MCMULLEN [scrapbook] 1, 2 (Laura Minerva KEINARD , Margaret Elizabeth KENNEDY , Hannah BITLER , Jacob , Daniel , Johannes ) was born on 13 Mar 1919 in Geigertown, Berks Co, PA. She died on 10 Jan 2001 in Nutmeg Pavilion Healthcare, New London, CT. She was buried in Jan 2001 in St Jame's Lutheran Church Cemetery, Geigertown, Union Twp, Berks Co, PA.
Loretta resided in 1920 in Union Twp, Berks Co, PA. She graduated with Birdsboro High School in 1936. She was issued a social security number before 1951 in PA. She was a member of St. Paul's United Church of Christ in Birdsboro, Berks Co, PA. She resided in N Washington Ave, Niantic, CT. She was a member of Bird Chapter 460, Order of the Eastern Star in Birdsboro, PA. She was a member of Birdsboro Women's Club in Birdsboro, Berks Co, PA. She resided from 1996 to Jan 2001 in Niantic, CT.
Loretta married John Robert WINTERHALTER "Robert" 1, son of John T WINTERHALTER and Edna H LEVAN. Robert was born on 7 May 1918 in Exeter Twp, Berks Co, PA. He died on 30 Nov 1944 1 in Germany. He was buried in St Jame's Lutheran Church Cemetery, Geigertown, Union Twp, Berks Co, PA.
Robert resided in 1920 in Exeter Twp, Berks Co, PA. He resided in 1930 in Exeter Twp, Berks Co, PA. He served in the military 2 with PFC (Medic), Service #33622185, Medical Detachment 26th Inf, Killed in Action in WW II 1 in Germany. + 11341 F i Suellen WINTERHALTER. Loretta also married Robert E DAVIDHEISER [scrapbook] 1, 2, son of Edgar R DAVIDHEISER and Margaret Ethel BEIDLER "Maggie". Robert was born on 17 Jul 1918 in Birdsboro, Berks Co, PA. He died on 26 Nov 1984 3 in Reading Hospital, West Reading, Berks Co, PA. He was buried in Nov 1984 in St James Lutheran Church Cemetery, Geigertown, Berks Co, PA.
Robert resided in 1920 in W 1st St, Birdsboro, PA. He resided in 1930 in 326 West First St, Birdsboro, PA. He served in the military with U.S. Army in WW II. He was issued a social security number before 1951 in PA. He worked as cost accountant with Birdsboro Corp. in Birdsboro. He was a member of St. Paul's U.C.C. (president, treasurer, Sunday school teacher) in Birdsboro. He resided in Nov 1984 in 515 W. Fourth St, Birdsboro, Berks Co, PA.
+ 11342 F ii Suellen WINTERHALTER is printed as #11341. + 11343 F iii Marianne DAVIDHEISER. 6200. Lawrence Merrill MCMULLEN 1, 2 (Laura Minerva KEINARD , Margaret Elizabeth KENNEDY , Hannah BITLER , Jacob , Daniel , Johannes ) was born on 5 Mar 1927 in PA. He died on 27 Mar 2017. Lawrence resided in May 1994 in Geigertown, Berks Co, PA. He resided in 2001 3 in Geigertown, Berks Co, PA.
Lawrence married Gladys June WENGER about 16 Aug 1948 in Berks Co, PA.
+ 11344 M i Merrill Lee MCMULLEN. + 11345 M ii Larry Ray MCMULLEN Sr.
+ 11346 M iii George MCMULLEN. 6205. Dawn A MCMULLEN [scrapbook] (Laura Minerva KEINARD , Margaret Elizabeth KENNEDY , Hannah BITLER , Jacob , Daniel , Johannes ) was born in 1929. She died in 1978. 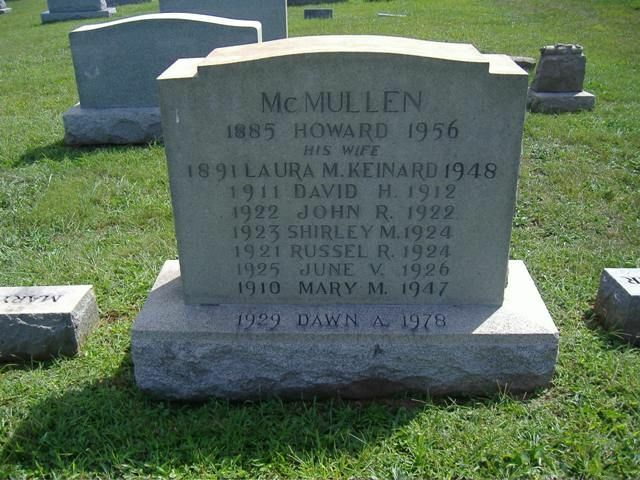 She was buried in St. James Lutheran Church Cemetery, Geigertown, Union Twp, Berks Co, PA.
+ 11347 F i Laura A MCMULLEN. 6207. Melvin Leroy KEINARD [scrapbook] 1, 2 (Frederick Leroy KEINARD , Margaret Elizabeth KENNEDY , Hannah BITLER , Jacob , Daniel , Johannes ) was born on 27 Aug 1921 in Baumstown, Exeter Twp, Berks Co, PA. He died on 17 Mar 2004 in Reading Hospital, West Reading, Berks Co, PA. He was buried on 22 Mar 2004 in St John's Union Cemetery, Gibraltar, Robeson Twp, Berks Co, PA.
Melvin resided in 1930 in Exeter Twp, Berks Co, PA. He resided in 2004 in Octagon Ave, Sinking Spring, Berks Co, PA. He worked as Reading [railroad] Co - 42 Yrs. He was a member of St John's Lutheran Church in Gibraltar, Berks Co, PA. 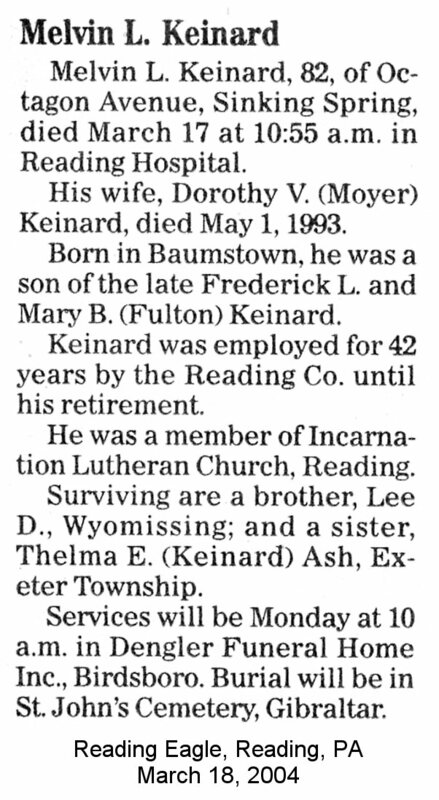 He was a member of Incarnation Lutheran Church in Reading, Berks Co, PA.
+ 11348 F i Sandra KEINARD. Melvin also married Dorothy V MOYER "Dottie" [scrapbook] 1, daughter of Calvin F MOYER and Amy SCHEIDT, about 6 Apr 1966 in Berks Co, PA. Dottie was born on 13 Dec 1914 in Lehigh Co, PA. She died on 1 May 1993 in Reading Hospital, West Reading, Berks Co, PA. She was buried in St John's Union Cemetery, Gibraltar, Robeson Twp, Berks Co, PA.
Dottie worked as Reading Hospital - Nursing Staff from 1960 to 1974 in Reading, Berks Co, PA. She resided in 1993 in 1806 Portland Ave, West Wyomissing, Berks Co, PA. She was a member of Incarnation Lutheran Church - Member in Reading, Berks Co, PA.
11349 F ii S Ann KEINARD. S Ann KEINARD married RUTH. 6210. 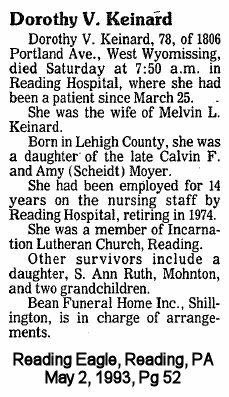 Thelma Edith KEINARD 1, 2, 3, 4 (Frederick Leroy KEINARD , Margaret Elizabeth KENNEDY , Hannah BITLER , Jacob , Daniel , Johannes ) was born on 14 Mar 1929 in Baumstown, Exeter Twp, Berks Co, PA. She was christened on 18 Apr 1929 in Alleghenyville UCC, Alleghenyville, Berks Co, PA. She died on 10 Mar 2018 in Exeter Greens Care And Rehabilitation Center, Exeter Twp, Berks Co, PA. She was buried on 15 Mar 2018 in Limerick Garden Of Memories, Limerick, Montgomery Co, PA.
Thelma resided in 1930 in Exeter Twp, Berks Co, PA. She resided in Mar 2004 in Exeter Twp, Berks Co, PA.
Thelma married Forrest Donald ASH 1, 2, 3, son of John Freeland ASH and Mary Elizabeth MILLER, about 11 Jun 1951 in Berks Co, PA. Forrest was born on 21 Dec 1928. He died on 23 Apr 2009 in Reading Hospital And Medical Center, West Reading, Berks Co, PA. He was buried on 28 Apr 2009 in Limerick Garden Of Memories, Limerick, Montgomery Co, PA.
Forrest served in the military with U.S. Army Engineers in Korean Conflict. He was issued a social security number before 1951 in PA. He resided until 2000 in Exeter Twp, Berks Co, PA. He worked with Kiwi Brands from 1970 to 1992 in Douglassville, PA. He resided from 2000 to 2009 in Berks Heim, Bern Twp, Berks Co, PA.
+ 11350 M i Forrest David ASH. + 11351 F ii Robin Sharon ASH. 6212. Lee D KEINARD (Frederick Leroy KEINARD , Margaret Elizabeth KENNEDY , Hannah BITLER , Jacob , Daniel , Johannes ). Lee married Mary Jane FRAZER. 11352 F i Kathy KEINARD. 6214. 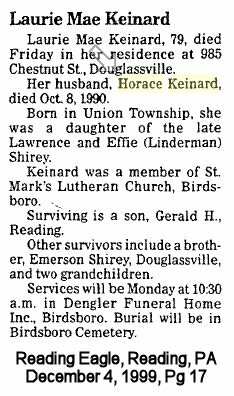 Horace KEINARD 1 (Elmer Earl KEINARD , Margaret Elizabeth KENNEDY , Hannah BITLER , Jacob , Daniel , Johannes ) was born on 18 Feb 1918 in PA. He died on 18 Oct 1988 in Douglassville, Berks Co, PA. He was buried in St Michael's Cemetery, Birdsboro, Berks Co, PA.
Horace was confirmed a member of the St. John's Lutheran church on 5 Apr 1936 in Gibraltar, PA. He was issued a social security number before 1951 in PA. He served in the military with Pvt 69th Div 271st Inf in WW II. Horace married Laurie Mae SHIREY [scrapbook], daughter of Lawrence L SHIREY and Effie Mae LINDERMAN. Laurie was born on 4 Jan 1920 in Union Twp, Berks Co, PA. She died on 3 Dec 1999 in At Home, Douglassville, Berks Co, PA. She was buried on 6 Dec 1999 in St Michael's Cemetery, Birdsboro, Berks Co, PA.
Laurie was issued a social security number before 1951 in PA. She resided in 1999 in 985 Chestnut St, Douglassville, PA. She was a member of St Mark's Lutheran Church - Member in Birdsboro, Berks Co, PA.
+ 11353 M i Gerald H KEINARD. 6215. Margaret May "Peggy" KEINARD 1, 2, 3 (Elmer Earl KEINARD , Margaret Elizabeth KENNEDY , Hannah BITLER , Jacob , Daniel , Johannes ) was born about Apr 1919 in Robeson Twp, Berks Co, PA. She died on 26 Dec 2011 in Reading Hospital & Medical Ceneter, West Reading, Berks Co, PA. She was buried on 30 Dec 2011 in Forest Hills Memorial Park, Reiffton, Berks Co, PA.
Peggy resided in Oct 2006 in Gibraltar, Berks Co, PA. She was a member of St. John's Lutheran Church in Gibraltar, PA.
Peggy married Charles Arthur HUBER Sr 1, 2, 3, son of Walter B HUBER and Annie V STEINMETZ. Charles was born on 25 Jul 1917 in Birdsboro, Berks Co, PA. He died on 20 Feb 2008 in Reading Hospital, West Reading, Berks Co, PA. He was buried on 23 Feb 2008 in Forest Hills Memorial Park, Reiffton, Berks Co, PA.
Charles resided in 1920 in Mill St, Birdsboro, Berks Co, PA. He resided in 1930 in 294 Canal St, Birdsboro, Berks Co, PA. He worked as owner-operator (50 yrs) with Amoco Service Station from 1932 to 1982 in Gibraltar, PA. He resided in Oct 2006 in Gibraltar, Berks Co, PA. He was a member of St. John's Lutheran Church in Gibraltar. He was a member of Gibraltar Fire Company. He resided in Feb 2008 in Robeson Twp, Berks Co, PA.
+ 11354 M i Charles Arthur HUBER Jr.
+ 11355 F ii Bonnie LaRue HUBER. 6216. Gladis Virginia KEINARD (Elmer Earl KEINARD , Margaret Elizabeth KENNEDY , Hannah BITLER , Jacob , Daniel , Johannes ). + 11356 M i Marlin CONRAD. 6217. Anna K KEINARD (Heber David KEINARD , Margaret Elizabeth KENNEDY , Hannah BITLER , Jacob , Daniel , Johannes ). Anna married Franklin Samuel SEITZ [scrapbook], son of SEITZ and Anna HUBER. The marriage ended in divorce. Franklin was born on 18 Mar 1914 in Birdsboro, Berks Co, PA. He died on 18 Nov 1986 in Community General Hospital, Reading, Berks Co, PA.
Franklin was issued a social security number before 1951 in PA. 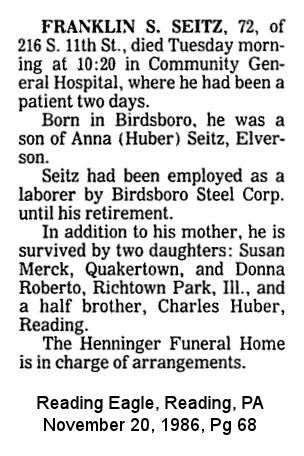 He worked as Laborer with Birdsboro Steel Corp.
+ 11357 F i Susan SEITZ. + 11358 F ii Donna L SEITZ. 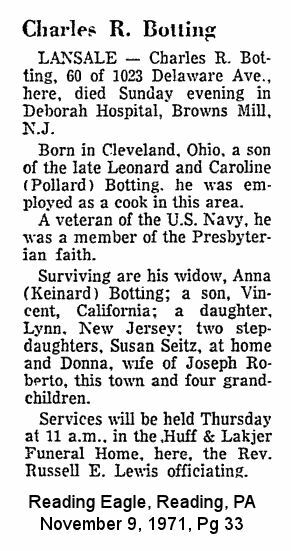 Anna also married Charles R BOTTING [scrapbook], son of Leonard BOTTING and Caroline POLLARD. Charles was born on 16 Jun 1911 in Cleveland, OH. He died on 7 Nov 1971 in Debora Hospital, Browns Mill, NJ. Charles was issued a social security number before 1951 in NY. He resides in 1971 in 1023 Delaware Ave, Lansdale, Montgomery Co, PA. He worked as cook in 1971. He served in the military with U.S. Navy. He is a member of the Presbyterian church.